Men are always repairing the road in New York City. Roads are uniquely vulnerable to the elements. Water, especially during the freeze-and-thaw cycle between fall and spring, is another major irritant. And just below the surface, there is another complication to their well-being: a labyrinth of aging infrastructure. In this painting the men are repairing that infrastructure. Parts of it are more than a century old. And, unlike local governments elsewhere, the city doesnt control what goes on in the subterranean tunnels and tubes. Every day, dozens of private companies cut into the asphalt to maintain their telecommunications, electricity, gas or steam networks. I chose this subject because we need to acknowledge the work that goes into repairing our city streets and be grateful for those that make it safe. The Men At Work is a unique composition that illustrates men dedicated to modernizing our infrastructure often taken for granted. Men are always repairing the road in New York City. Roads are uniquely vulnerable to the elements. Water, especially during the freeze-and-thaw cycle between fall and spring. 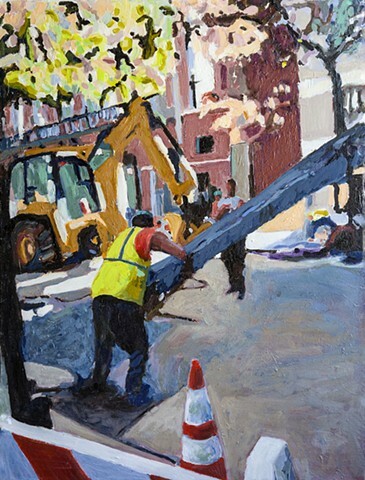 This painting is a tribute to all workmen who continue to enhance the infrastructure that we all take for granted. This painting will be shipped carefully in a box. It is signed on the front and back and accompanied with a certificate of authenticity. The canvas sides are painted a neutral tone to match the painting.